When I went vegan 34 years ago, it was because it seemed to be the right thing to do. I was rarely shy about discussing it with people, and challenging their nonvegan eating and behavior because I felt so strongly about it. I had gone vegetarian five years earlier, as my understanding of things grew and I learned of the connections between eating meat and human hunger, deforestation, pollution, species extinction, physical disease, mental obtuseness, spiritual deadening, and most of all, the hideous violence routinely perpetrated on animals used for food. 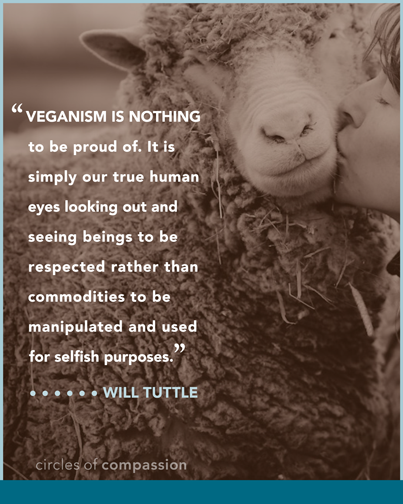 As I learned more about the cruelty involved in dairy and egg production, as well as in wool, leather, silk, honey, and in zoos, product testing, and the myriad other culturally-approved products and activities, I went vegan and endured the excruciating awakening that this can bring. The painful realization that my home culture is actually insanely cruel and disconnected, and that I am in many ways a product of that culture in my attitudes and behavior propelled me not just to go outwardly vegan with enthusiasm and commitment. I also yearned to understand how I might be able to go vegan at the deeper levels of my being, and embody veganism in a way that would increase my effectiveness as an advocate of vegan living to others. Going vegan is like a second birth. Like birth, it is painful and disorienting to be ejected from the warm security of the known and comfortable, and like birth, it’s also liberating to begin a whole new life adventure of greater awareness. Freeing ourselves and emerging from the cultural trance injected into us by the societal food rituals that desensitize us and reduce our capacities, the vegan birth clears the way so that we can explore the deeper dimensions of consciousness. As we open to the hidden pain and trauma we inflict on animals and each other, we also open to more fully realizing the essential beauty, benevolence, freedom, and compassion that sing and shine as the heart of being and that are reflected in our world around us in all living beings. In my case, the years of research and contemplation that followed this second birth resulted eventually in my authoring The World Peace Diet. This book, now translated into a dozen languages, attempts to illuminate the deep structure of our culture as organized fundamentally around enslaving nonhuman animals and the implications of that for social justice, physical and spiritual health, peace, and sustainability. In the seven years since, these understandings have continued to grow and spread through our culture and our movement. With the birth of this new volume that I’m honored to be editing, Circles of Compassion: Connecting Issues of Justice, we behold a whole chorus of inspired voices who are now making these connections in profound and liberating ways. In Circles of Compassion, we have the insights and experiences of people who have spent years working not just with the liberation of nonhuman animals, but within that context working to raise consciousness about racism, sexism, chronic hunger, ableism, war, heterosexism, environmental devastation, corporatism, and economic inequity. Through their efforts, an empowering understanding is emerging that helps us see the connections among all these various forms of injustice and violence, and how we can most effectively transform our relationships, our crises, and our cultural situation. Why do we have such seemingly intractable problems? Are we genetically flawed as the only species on Earth that is bent on its own destruction and the ruination of the other inhabitants as well? Or are there cultural factors at play that we can understand and change? Although there are powerful internal and social factors that work to repress authentic understanding, more and more people are discussing the intersection of various justice issues, and seeing that there is a common core mentality at work. It is also becoming increasingly obvious that the underlying mentality causing our problems is injected into us via our cultural programming, and that it is not innate. We also increasingly understand that we live in what is essentially a herding culture—a culture fundamentally organized around confining and killing animals for food and other products. We are discovering that this behavior of killing and eating animal-sourced foods is not only the most devastating behavior to our outer world, but that it is also (as we are fortunately beginning to recognize) the most damaging to the landscape of our inner world as well. In other words, besides being the driving force behind global climate change, rainforest destruction, air and water pollution, soil erosion, desertification, collapse of ocean ecosystems, species extinction, world hunger, chronic disease, economic inequality, and war, animal agriculture is also the driving force in creating the inner mentality that drives conflict, injustice, competition, and the various forms of social injustice that plague our world today, and it also reduces our innate intelligence and capacities to deal effectively with the problems we’re creating. Meals are the most powerful and universal rituals in any culture, and the primary way we learn about our relationship with nature, animals, and each other. In Circles of Compassion, we learn how, from a rich and remarkably wide variety of perspectives, the fundamental mentality required of us—to routinely reduce living beings to mere meat and instruments to be used—drives the engines that lead to racism, sexism, elitism, and classism, and the terrible suffering these entail. The good news is that with understanding comes empowerment. The authors contributing to the Circles of Compassion vision share their insights into the cultural, spiritual, emotional, and physical transformations they have experienced through their research and their work to heal the wounds that our culture inflicts on all of us growing up and living here. While all the authors are vegan, their perspective is outward and it is engaged with the larger social order, to inspire the larger social matrix with the power of the vegan approach that illuminates the roots of our problems. I am delighted to see the long-worked for birth of Circles of Compassion and what it represents. I believe there is no more powerful message we can make an effort to understand and articulate today. The quality of the writing in the volume is superb, and the ideas are cutting edge. May the birth of this new book help spur a new movement, and the needed rebirth of our culture’s innate wisdom and compassion. May we together transform our individual and collective lives to create a world that honors and reflects not only our potential, but also the beauty, creativity, and abundance of our Earth and the living web of life here. 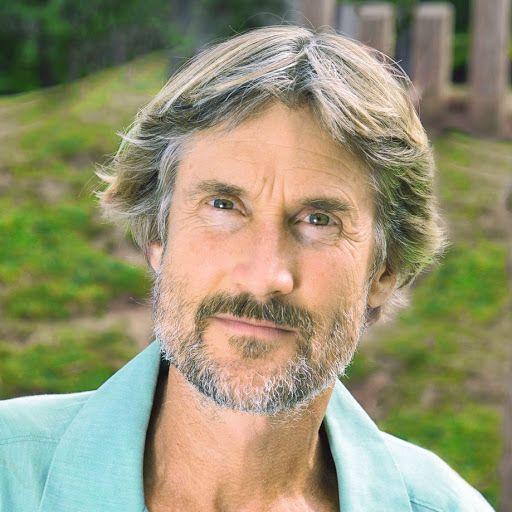 Dr. Will Tuttle, author of the acclaimed best seller, The World Peace Diet, is a recipient of the Courage of Conscience Award and creator of several wellness and advocacy training programs. A vegan since 1980 and former Zen monk, he has created eight CD albums of uplifting original piano music. He is a frequent radio, television, and online presenter and writer, and co-founder of Veganpalooza, the largest online vegan event. He typically presents over 100 lectures, workshops, and concerts annually both in North America and worldwide. Thank you, so beautifully said. I’m born again vegan and I see so clearly this time around? What a blesstbg? 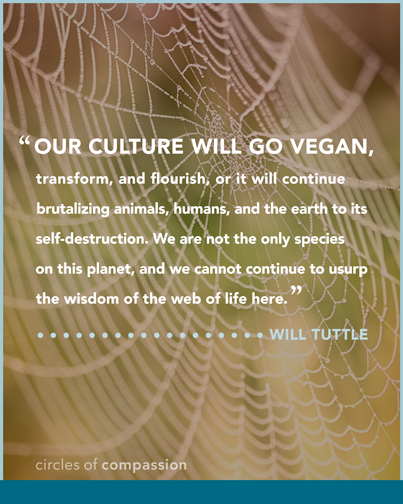 Will Tuttle is an awesome role model for all of us vegans. His writings and teachings are awakening thousands and helping in the re-birth of a more compassionate world. Thank you Will ! Vegan was the best life decision I ever made, and no it isn’t just a ‘personal choice’ when my past ‘choices’ were funding animal abuse.